Restrictions on religion increased around the world in 2016, according to Pew Research Center’s ninth annual study on global restrictions on religion. This is the second year in a row that overall restrictions on religion – whether the result of government actions or by individuals or societal groups – increased in the 198 countries included in the study. 1 More than a quarter (28%) of countries had “high” or “very high” levels of government restrictions on religion in 2016, an increase from 25% the year before. This is the largest share of countries in these categories since 2013. Countries in the “high” or “very high” categories scored at least a 4.5 on the Government Restrictions Index. The index is a 10-point scale based on 20 indicators of government restrictions on religion, including limits on proselytizing and public preaching, or detentions and assaults of religious group members. Laos, for example, joined the “very high” restrictions category in 2016, due in part to a new government decree that allows the Ministry of Home Affairs to stop any religious activity that it sees as counter to policies, traditional customs or laws within its jurisdiction. 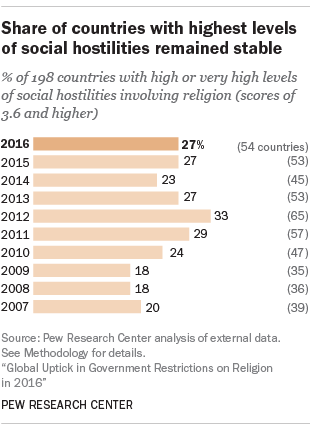 2 The share of countries with “high” or “very high” levels of social hostilities involving religion remained stable at 27%. Countries in these two categories scored at least a 3.6 on the Social Hostilities Index, a 10-point scale based on 13 measures of social hostilities involving religion, including tensions between religious groups and religion-related terrorism. Although the share of countries in these categories did not change since last year, it was higher than in 2007, when this study began tracking social hostilities. In addition, several countries joined these top two categories of social hostilities in 2016. Bangladesh experienced an increase in assaults and killings of members of religious groups by social groups or individuals – including multiple instances where people who had expressed atheist views or were accused of offending Islam on the internet were killed or threatened. 4 Overall, the number of countries where various religious groups were harassed either by governments or social groups increased in 2016. 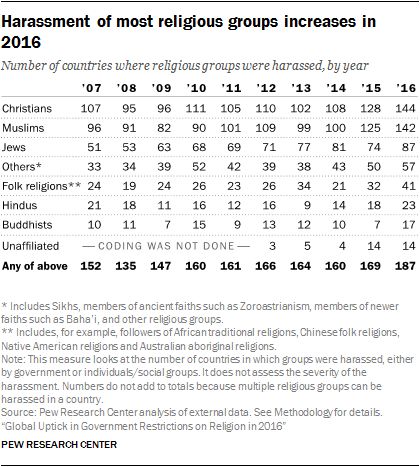 This represents the largest number of countries in which harassment took place since the start of these analyses in 2007, and all of the religious groups included in this report (with the exception of the unaffiliated) were affected. The most widely targeted groups in 144 and 142 countries respectively were Christians and Muslims, the world’s two largest religious groups. Jews were harassed in 87 countries, reversing a decrease that occurred in 2015. 5Among the 25 most populous countries in the world, Egypt, Russia, India, Indonesia and Turkey had the highest overall levels of religious restrictions. China had the highest levels of government restrictions on religion, while India had the highest levels of social hostilities involving religion. Both countries had the highest levels of restrictions in these respective categories, not only among the 25 most populous countries but also in the world at large.